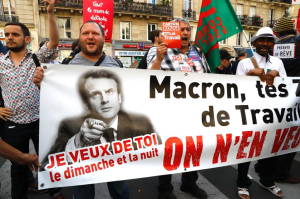 French President Macron began to roll out his reforms of the labour code last autumn, since which there has been a rash of redundancies, contradicting the oft-repeated claim that greater ‘flexibility’ will push down unemployment. Under the new rules, employers no longer have to justify redundancies by demonstrating that their businesses are in difficulty. The PSA conglomerate, manufacturer of Peugeots, Citroens and Opels, merrily cut staff by 2,200 under the new rules despite the clear evidence that the company was prospering, with record sales for each of the last four years. This prompted one employee to complain to Le Monde that "the better things are, the more they cut staff" (Cole Stangler, ‘Macron’s attack on workers’, Jacobin website, 2 March 2018). Whilst under the new rules, mandatory approval from unions is required before employers can act upon the new collective termination clauses, but some unions are prepared to barter (irreversible) redundancies for (very reversible) temporary concessions. Such was the case with PSA. Union resistance to Macron’s erosion of the labour code has been patchy, with CGT-led mobilisations undermined by more conservative unions. Frustration and rage boiled over into the May riots. Now the struggle to force back the reactionary labour reforms appears to have entered a crucial juncture. Two months into a three month series of rolling strikes across the state-owned SNCF rail network, rail workers are faced with a choice. Either follow the advice of the relatively militant CGT union and keep on track with the strike; or listen to the largest private sector union (the CFDT) and other ‘moderate’ unions which are starting to mutter about balloting members over a possible resumption of work. These siren voices justify their wobble by pointing to eleventh-hour government pledges to pay off the bulk of SNCF’s debt, a key demand of the unions. The government promises jam tomorrow in the form of two debt relief tranches to be delivered in 2020 and 2022. However 2020 also happens to be the year that new EU rules will crack open the French rail industry to competition and privatisation, or ‘survival of the fittest’ – i.e. the cheapest, most corner-cutting and most exploitative. Government promises on partially reversing disinvestment in the rail industry won’t count for much in the brave new dog-eat-dog world into which the industry will shortly be plunged when the European market is opened to passenger rail competition. The proposed transformation of the SNCF into a joint-stock company with the state as shareholder is universally understood (but naturally denied by the government) to be preparatory to outright privatisation. And even if this debt-relief pledge is actually honoured, it would be a small price for the bourgeoisie to pay if the result were to break up the united front so far maintained by all the rail unions, thereby nobbling the working class resistance to the labour reforms which rail workers have spearheaded. It was the train drivers that saw off attacks on security benefits in 1995, and again led the struggle to defend pensions in 2010. And this time around, in a poll of rail union members, 95% of those voting stood firm against the labour reforms. Rail workers, through their militancy and organisation, have won a relatively good level of employment protections for themselves, and it is this which is now under assault. By saying that the loss of those so-called ‘job for life’ protections will only apply to new recruits, the government hopes to persuade those already in possession of those protections to pull up the ladder behind them. The government tries to sugar the pill by suggesting that if rail workers consent to phase out ‘special status’ they may be rewarded by some vague new collective agreement instead. Let the buyer beware!